Prepare pancake mix according to the directions on the package. Let sit for 5 minutes. Spray a shallow non-stick pan with non-fat cooking spray; preheat pan on low to medium heat. Remove pan from the heat. Pour just enough batter to thinly coat the pan, swirling pan to spread evenly. Cook until the batter looks almost dry. Use a rubber spatula to lift the edges; turn onto the other side. Cook 30 to 60 seconds, remove from pan. Prepare pudding mix according to the directions on the package. 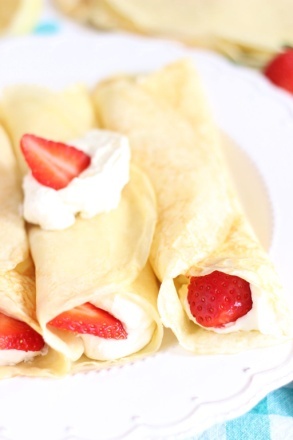 Fill each crêpe with the pudding mixture and add fruit, if desired. Roll crêpes closed. Top off with the whipped topping. Makes 1 serving or 3 crêpes.